You are buying the Forma Full Face Mask Medium/Large With Foam Seal 400471A CPAP, manufactured by Fisher & Paykel. Fisher & Paykel is a leading manufacturer of CPAP Masks and accessories. At ADW Diabetes, we do offer the complete product line by Fisher & Paykel at discounted pricing. 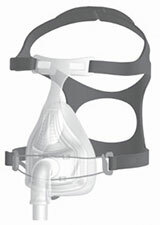 You are buying the Forma Full Face Mask Medium/Large With Foam Seal 400471A CPAP, manufactured by Fisher and Paykel. Fisher and Paykel is a leading manufacturer of CPAP Masks and accessories. At ADW Diabetes, we do offer the complete product line by Fisher and Paykel at discounted pricing. The Forma Full Face Mask Medium-Large Fisher and Paykel 400471A is a high performance device that has a unique under-the-chin cushion design, a special glider strap which will minimize leakage, and an efficient and advanced air diffusion system among other things. The Forma mask is latex free and comes with an easy fitting headgear and forehead support pad which will add more stability. The FlexiFoam cushion for the Forma full face mask is very soft and is designed to mold to the unique contours of your facial structure. The FlexiFoam cushion will provide excellent therapy and exceptional comfort for patients at the same time. The unique glider strap for the Forma full face mask is designed to improve your therapy experience. The glider strap reduces leaks by distributing pressure evenly across your face. The Forma full face mask features a unique advanced air diffuser which pushes air away from both you and your partner. The diffuser will also minimize noise and provide a much more quiet experience. The quick release cord is a convenient feature allows patients to quickly detach their headgear from the mask frame without compromising the fit.